Most awnings and porches are equipped with two or more sewn-in brackets for fitting storm straps. 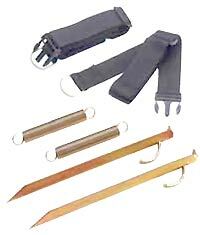 A Storm Straps kit usually consists of two straps, two springs & two steel pegs. Price includes p&p to MOST UK mainland postcodes.